Want lighter, shorter, and more maneuverable AR-15? But don’t want to deal with a SBR (short barreled rifle) tax stamp and months of waiting? With a pistol lower and legal pistol brace…you can skip the line and get a sub-16″ barreled AR. One of the most affordable entries for everything AR-15 is, of course…Palmetto State Armory (PSA). We’ve loved their normal length AR-15 offerings…but how do their pistol uppers fare? We’ll cover their popular 7.5″ & 10.5″ pistol uppers for fit, feel, finish, shootability, accuracy, and more. By the end you’ll know if they are for you…and which length is perfect for your end application. PSA got so big because it created good products at awesome prices. And how did it do that? Vertical integration. Everything after raw materials they do it in-house. 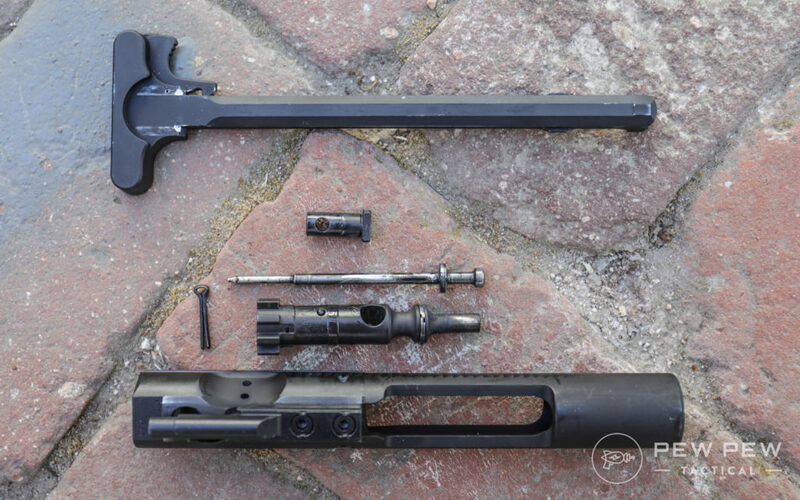 That’s how they make complete ready-to-shoot ARs for around $500…even with aftermarket furniture. I’ve done a couple reviews of their stuff and everything has been reliable. Some coloring issues here and there but I can overlook it due to the price. Check these other reviews out: 5.56 AR-15, .308 AR-10, 9mm AR-9,and .224 Valkyrie. HOWEVER…AR-15 pistols are a different beast because of their short gas systems. I’ve always had some trouble with my home-built versions so I was very curious to see how PSA made theirs reliable (or not). Check your local and state laws before buying an AR-15 complete pistol or upper. We’re not lawyers and this is not legal advice. Some cases you will need a specific Pistol lower…but for the most part you need a virgin lower that hasn’t been built into a rifle yet. 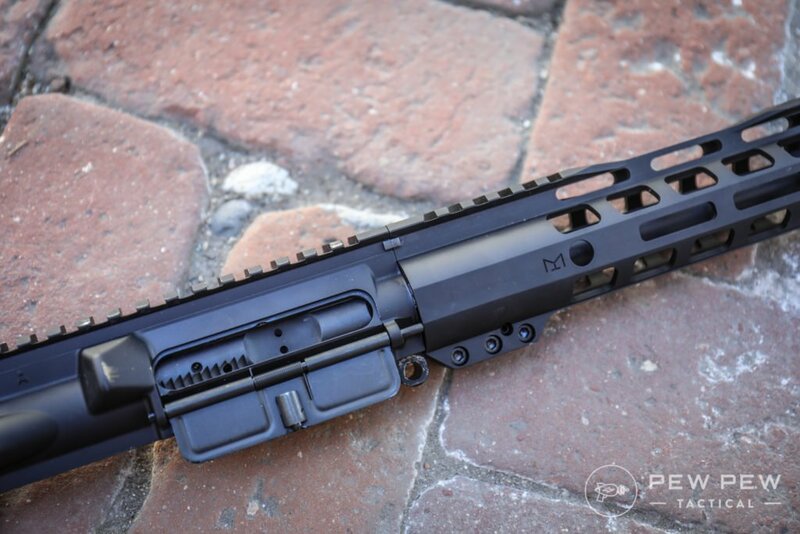 And if you don’t have a suitable lower…it might be illegal to have a sub-16″ upper. As for AR-15 braces…the current consensus from the ATF is that it’s A-OK to shoulder. However, I’d still recommend against it since local departments might not be working off current knowledge. 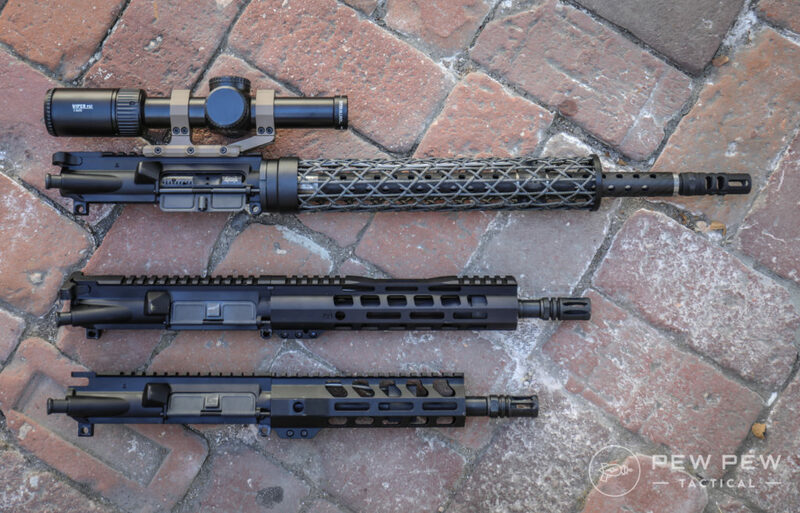 Check out our in-depth legality post in Best AR-15 Pistols and Best AR-15 Pistol Braces. Everything looked fine with PSA standards. The sometimes purple-ish hue I’ve received before was not there. 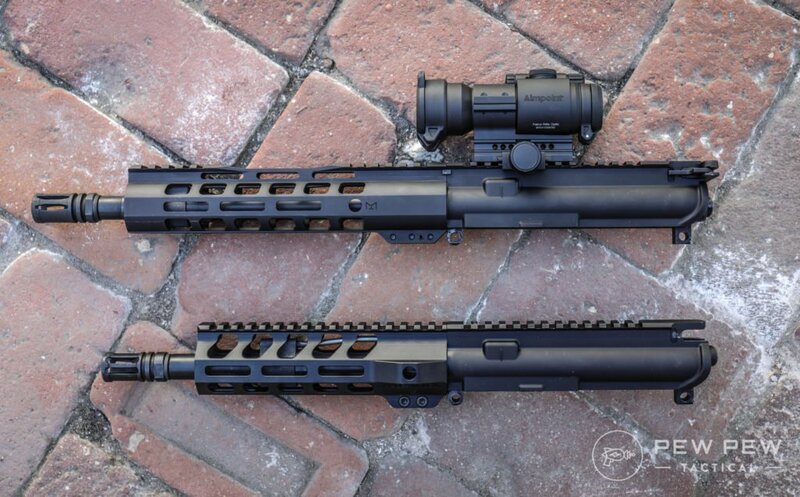 Each handguard matched the black color of the upper receiver. 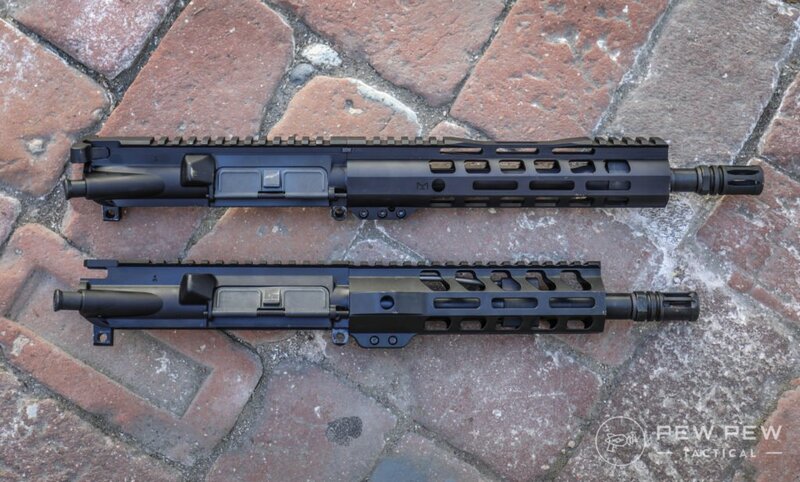 The 10.5″ and 7.5″ barrel uppers had drastically different handguards. And I liked some elements from each. However, it was a little sharper than the 7.5″ upper. But not so much that it bothered me…it just wasn’t beveled. I’d also rather have the entire rail for such a short upper in case I wanted to run lights/lasers. The slope of it feels good in hand but would make it kind of difficult to run a pressure pad. In the 7.5″ upper…the cutouts were beveled and felt nice in hand. But it didn’t have any alignment ears. Nothing moved since the tension screws were ok during testing…but I’d rather have something to keep it aligned. I did appreciate the full rail…especially on a shorter handguard/barrel setup. 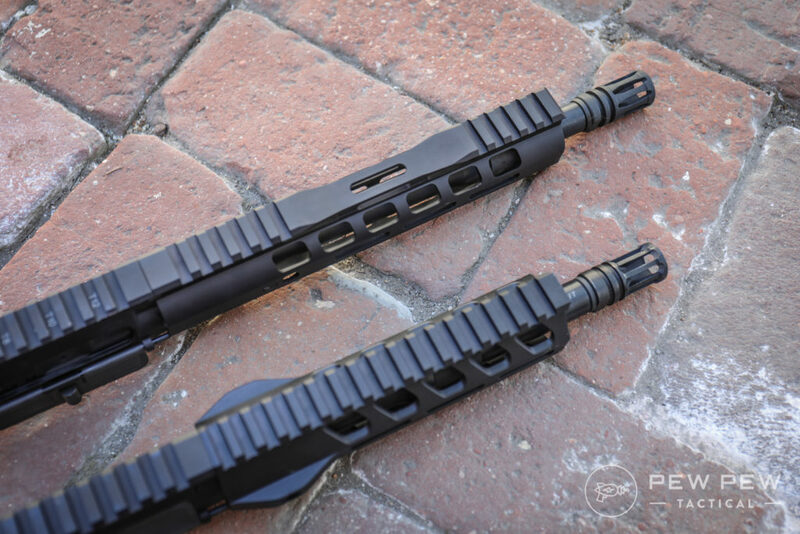 Taking off the handguards…you can see the differences between the 7.5″ and 10.5″ gas systems. 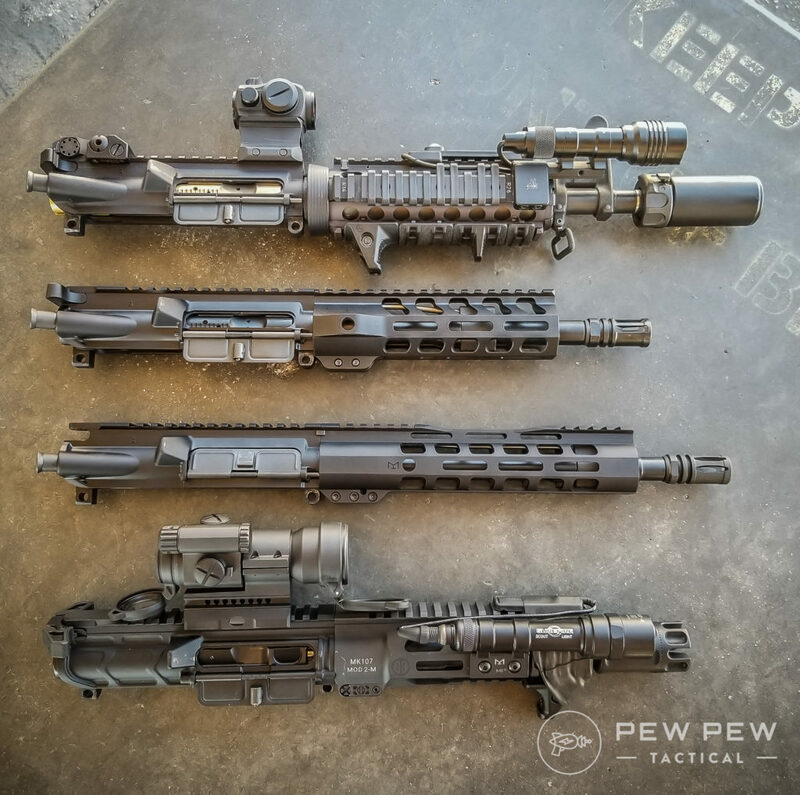 The 10.5″ is running a carbine length while the 7.5″ is running a pistol length. General rule of thumb is that the longer the gas system…the milder the recoil impulse and the better the reliability. 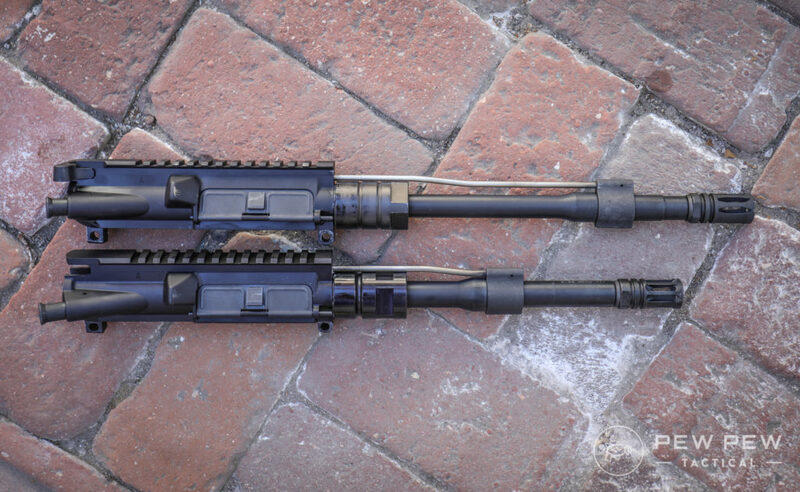 You can see them compared with a mid-length gas system (my favorite for a 16″ barrel). Barrels are Nitride coated which has a nice smooth black color but isn’t too shiny. 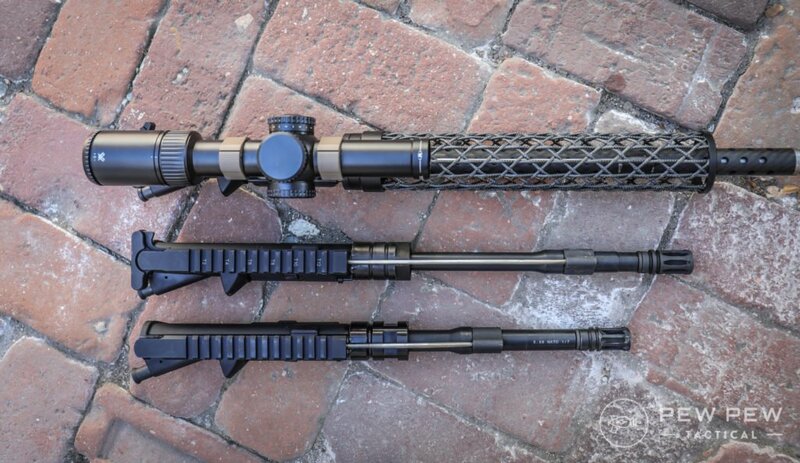 PSA’s nitride barrels are their middle-of-the-road barrels. The gas blocks were attached with correct torque…they aren’t coming off unless you want them too. BCG (bolt carrier group) and charging handle were mil-spec (military specification) and ran fine. I do like that the bolt is marked “MP” for magnetic particle inspected…and that the BCG gas key was property staked. And in all…everything was where it should have been. Now onto what really matters! I’ve had bad luck with AR-15 pistols…at least the ones my friends and I have built. Something always goes wrong with the gas system. I’m glad to say that I experience no failures with the two PSA uppers in over 500 rounds total. 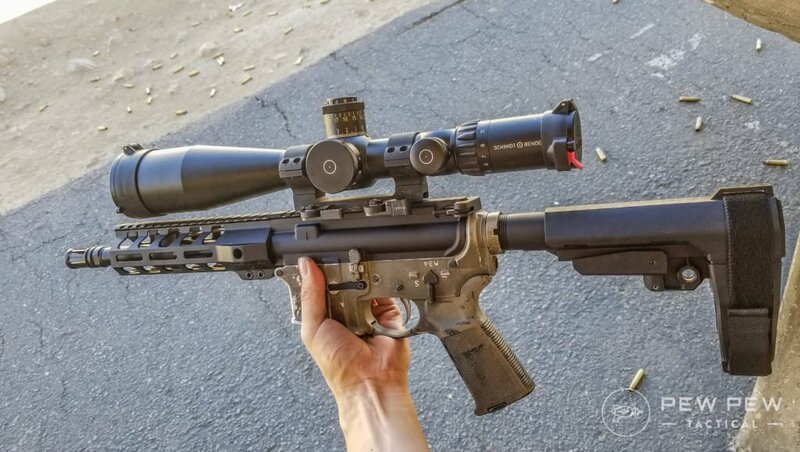 Of course…the recoil was a little more than a standard 16″ barrel AR…but that was to be expected. Here’s the 10.5″ in action with a standard A2 flash hider. It got a little hairier with the 7.5″ upper. Check out the increased recoil and gases coming out. But still not unpleasant to shoot if you have a decent brace like the SB Tactical SBA3. After about 200 rounds through each upper with no cleaning or break-in…I set up 100 yard targets. I shot at a brisk pace of one shot every 3-5 seconds or so…whenever I got my sights back on target. I let the barrel rest about 5 minutes between each new load. The Wolf Gold (cheapest plinking round) was all over the place…likely 10 MOA (1 minute of angle = roughly 1 inch at 100 yards). 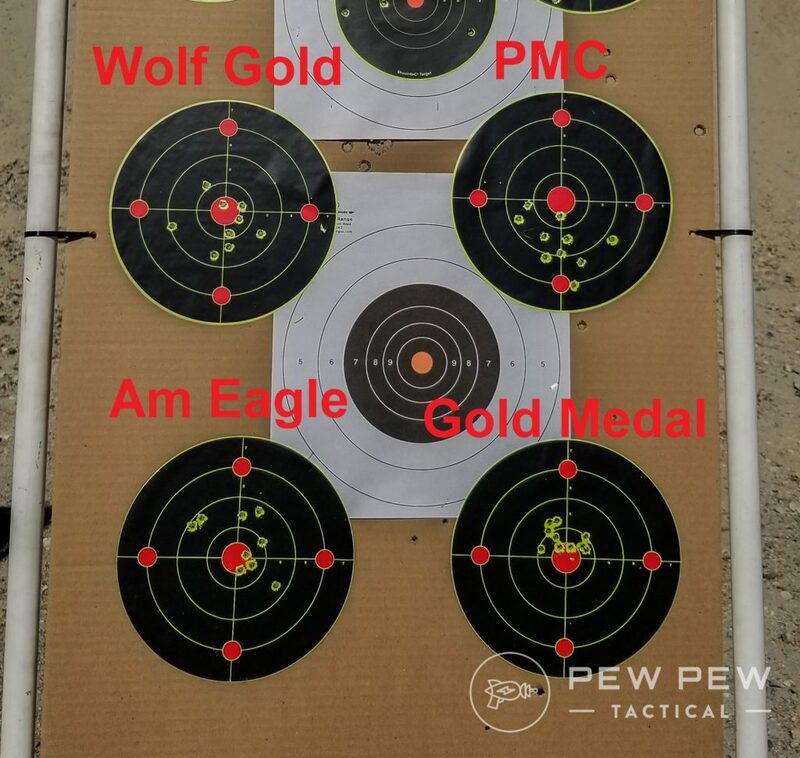 PMC fared the best in terms of affordable rounds with around 4 MOA and American Eagle was a little worse at ~6 MOA. 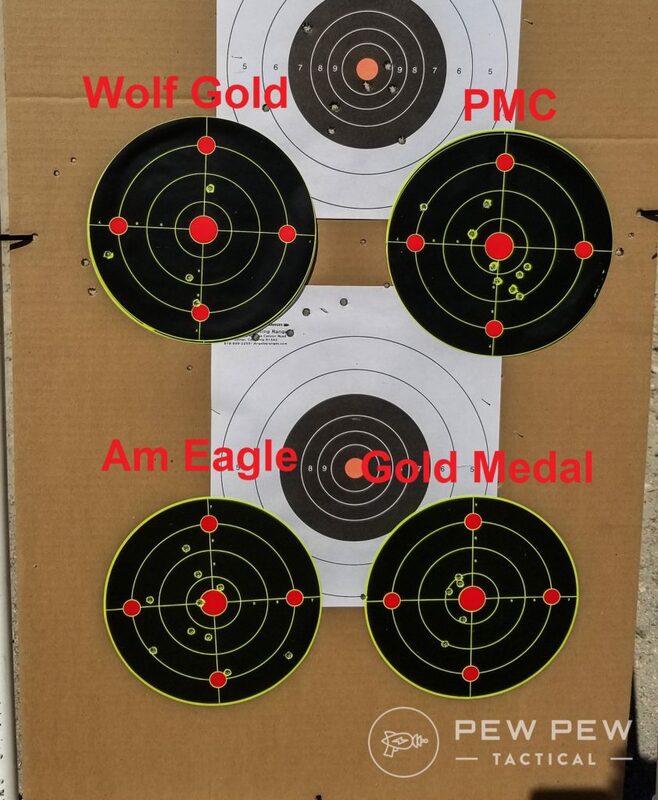 Match ammo Federal Gold Medal did the best with around 2-3 MOA. A LOT more consistent…the plinking rounds of Wolf, PMC, and American Eagle all scored around 4 MOA…which is military specification for the longer 14.5″ M4. And the match ammo was a solid 2 MOA. Good for human sized targets up to 300 yards which is more than acceptable for an AR pistol. Check out Best AR-15 Ammo for my go-to choices for self-defense and plinking rounds. For me…I liked shooting the 10.5″ a lot more. 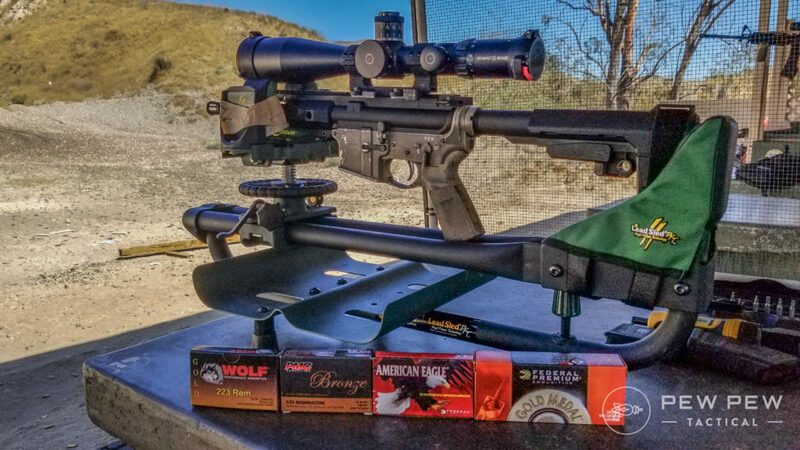 If you value a better shooting experience and probably more reliability…opt for that. 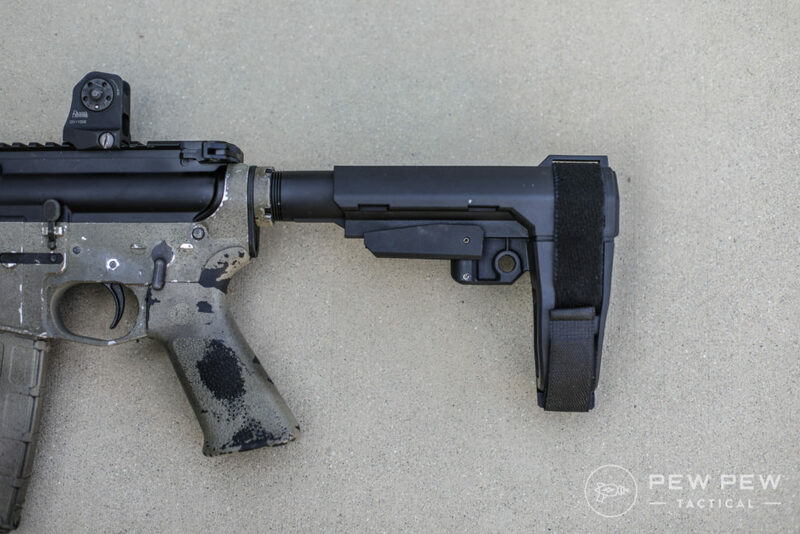 If you want the shortest possible AR-15 pistol…get the 7.5″. There’s a couple models, and they go in and out of stock a lot…but I like the SBA3 brace versions since it has a good cheekweld and is adjustable. 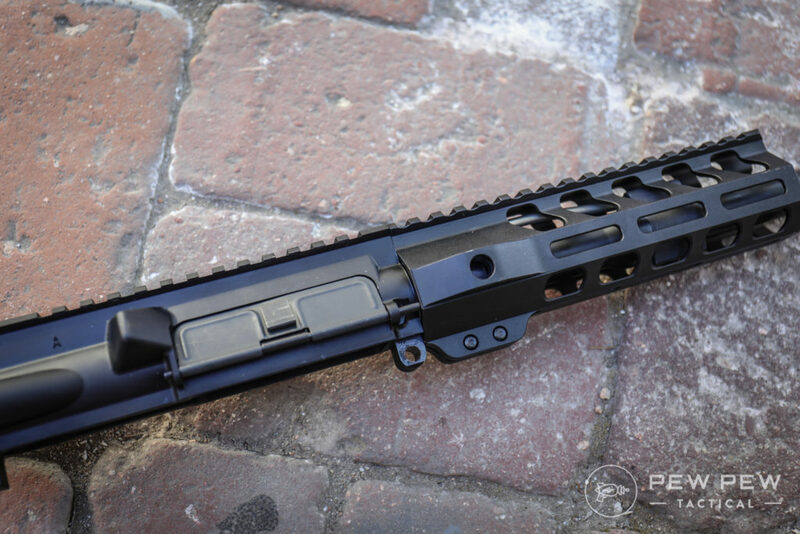 Check out our full review in Best AR-15 Pistol Braces. But, if you’re new to PSA…my normal advice and the best option is to split up the upper and lower so you don’t pay a complete firearm tax. Again, I like the SBA3 Brace and would probably get the MOE pistol grip and EPT trigger (PSA’s decently crisp mil-spec version). 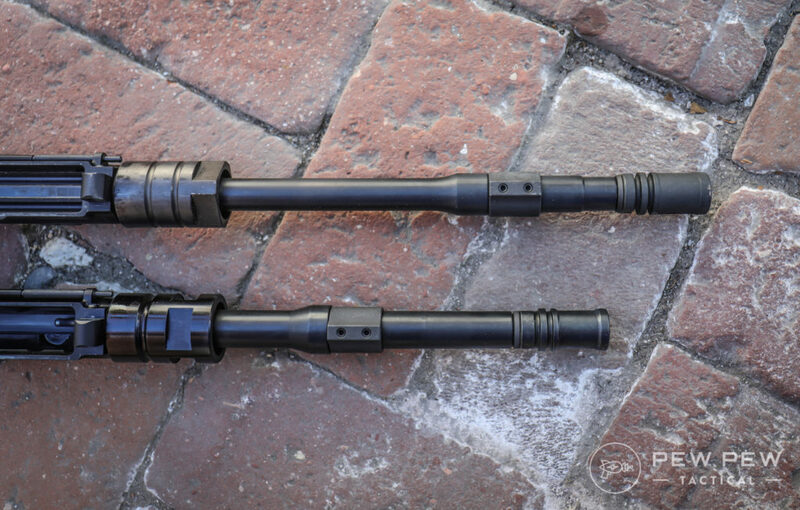 Prices go from $259 for shorter barrels to $369 for 10.5″ versions. I’d opt to include BCG (bolt carrier group) and CH (charging handle) unless you already have those. Most will come with flip-up sights and the choice of flash hider or fluted flash can (which projects noise/gas forward…good for clearing rooms but will create a fireball at night). I like the flash hider option. Be sure to add on a stripped lower receiver. An AR-15 pistol is basically an AR-15. So the standard Best AR-15 Upgrades apply. Except don’t add a traditional vertical grip since it moves it from pistol to AOW (any other weapon) category. My advice is to get a hand-stop since if you usually shooter longer guns…you might straighten out your arm. Not the end of the world if you have a 16″+ gun. But finger-losing-bad in a short barreled gun. My go-to is the Magpul Handstop that you can install complete or only the larger section. Both ways shown above in the first and last upper. 500 rounds with 4 different types of ammo and three different magazine brands…no malfunctions. Which is saying something for a short gas system AR pistol! Merely OK if we’re comparing with 16″ variants…but great for 7.5″ and 10.5″ inches. You’re going to be fine hitting torso-sized targets out to 300 yards. 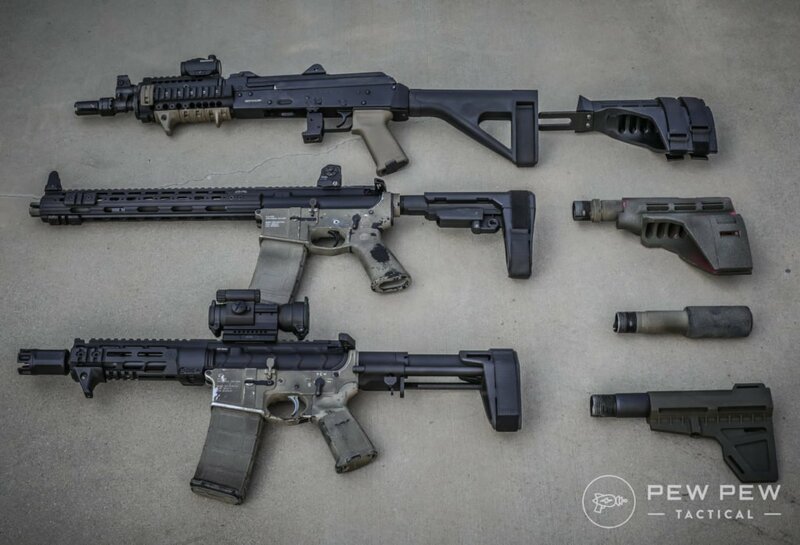 Handguards come in a couple different styles depending on what PSA has in stock. But they all do their job. Coloring matches up for both my uppers and I like the Nitride barrel compared to Phosphate (bumpy and dull). It’s an AR…and all the handguards are M-LOK so you can do almost anything (no vertical grips unless you’re applying for an AOW). Trigger if you get the EPT is decent for a reliable mil-spec and the SBA3 brace is comfy. Opt for an optic (Best AR-15 Optics) to wring out all the accuracy. Great deal if you build from the kit…but even if you do the complete upper and lower…you’re getting an AR-15 pistol for ~$500. There you have it…quite possibly the most affordable (and reliable) option to start into the world of AR-15 pistols. I recommend getting the complete upper in 10.5″ for better recoil management and reliability…plus the flash hider unless you’re working with teammates in close quarters. And the lower with the SBA3 brace. Are you getting a PSA AR-15 pistol now? Or if you already have one…how does it perform in terms of reliability and accuracy? 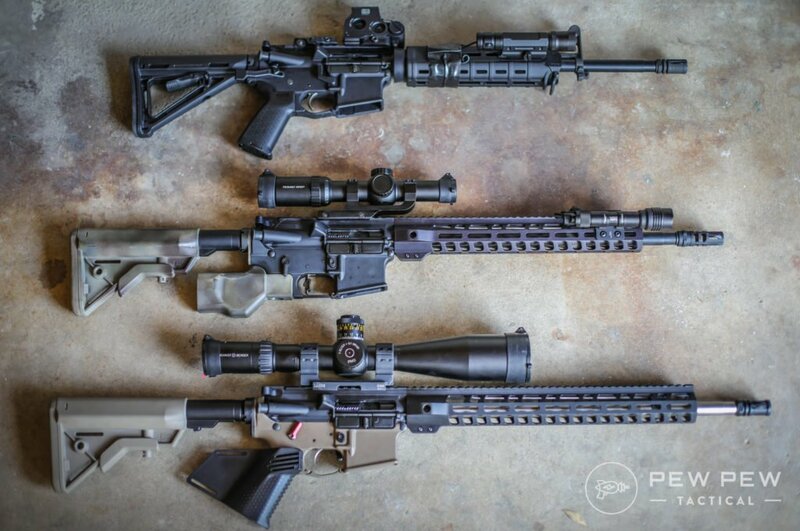 See more in our Best AR-15 Pistols Guide. One of the bigger considerations I would have liked to have known before buying my 10.5 psa upper would have been the difference in muzzle blast and sound. A 14.7″ pinned and welded to 16 seems like a better option for most people. Hi Eric do you live in CA? 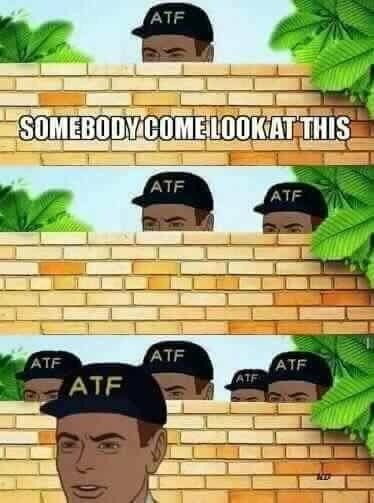 Just curious to know if you do, how you managed to do the AR pistol in CA? Not looking for legal advice. Just remembered you did the Featureless AR15 post and a lot of your AR15’s in reviews seem to be fixed magazine or featureless. I’ve been looking to do an AR pistol in CA but theres so many grey areas and what seems like major hoops to jump through. I want to build a 10.5 pistol but want a decent trigger then the standard ones. So mostly would get a stripped lower. Want one for 9mm though. Why are you needing to reset your sights back on target when you’re using a lead sled? That’s literally the point of using one to take all human elements out of the equation. Hey Bob, good question. It keeps it on target but there’s still some movement after each shot.